The conclusion of the 37th cycle of the daily study of Rambam was celebrated in Buenos Aires, Monday the 5th of Tishrei – 25th of September. The evening began with a Dialogue about Teshuva, with Rabbis Tzvi Grunblatt, Shlomo Levy and Osher Farkash, moderated by Rabbi Eliezer Chama. 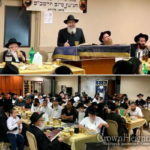 The crowd than continued to a lavish Seudas Mitzva prepared by Rabbi Ioshu Kapelushink, Rabbi Chaim Lapidus made the Siyum and shared some fascinating thoughts about the importance of learning Rambam daily, Rabbi Mendy Naki made the Haschala of the new cycle, Rabbi Tzvi Grunblatt than inspired the crowd about the importance of Hiskashrus and the Rebbes gift to the world of the daily study of Rambam. 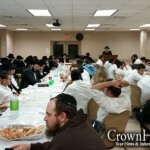 The crowd enjoyed Chasidishe Nigunim, Video presentation, a special Spanish version of the Derher Magazine. The crowd stayed on to Farbreng with Rabbi Osher Farkash. 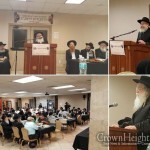 The event was arranged by Tzach – Chabad Lubavitch Argentina.